While we were up in Mercer, WI a couple of weeks back, I had set a goal to catch a musky with some of the equipment Rob gave me the last time I saw him. He gave me his musky rod and lures because he knew I would use them. It meant more to me than most of my possessions. It's weird how sentimental you can get about such things, but when someone very close to you passes away, you kind of grab on to what you can of them in a desperate attempt to heal some of the pain. To some it's jewelry, some a car, and some it's fishing stuff. My friend Steve got his brother's golf clubs and he treasures those. Mercer is where my brothers Paul and Rob both caught their muskies. Paul caught his first when one year he decided to try fishing for musky - a very difficult fish to catch - after having such crappy luck fishing for anything else on Spider Lake. We wished him luck as he headed out with his rod and a very large lure. Turns out he caught one on his first cast, a feat that is nearly impossible. Musky are known as the fish of 10,000 casts, though they say with modern stocking and tackle/techniques, it is now more like 3,000 casts. In any case, they are not the fish of one cast, that's for sure. Seeing Paul catch one, sparked the interest of Rob and the next year (2006) he caught his first musky (above) in a spot very near to where Paul got his. (No, not tellin' where.) A few years later I managed to get my first one in the same county, but on a different lake. All of this left Tom, my eldest brother, as the only one without a musky to his credit. So, as I said, my goal was to catch a musky in Rob's honor. I got up early 3 days in a row, by 6:30 and got on the water. I fished using Rob's rod and reel, and I fished using my own new rod and reel. I threw lures from big to small. I tried it early in the morning and literally 10:00 at night. (Fishing at night was a first for me and quite a strange experience, especially with steam rising off the water which created an eerie scene.) I tried the old spots and familiar bays and the new spots including the narrows and other areas. I threw and reeled, threw and reeled and threw again. I threw until my fingers were blistered and my shoulder blades were sore. I was desperate. "Must catch fish. Must catch fish." While we were busy trying the whole weekend, so were my brothers Tom and Paul. Paul was trying solely for Musky and Tom for anything with fins. We had heard from a guy on the lake that he'd landed two musky on Saturday, but we had not so much as a follow to our credit. We came home Sunday night to report that we had failed yet again to get a fish. It looked like there would be no musky this trip. I walked down to the big family cabin at Pine Forest Lodge where the bulk of the family was staying. 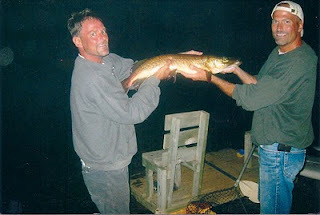 When I walked in, I quickly found out that Tom had caught a 36" musky that evening about dusk. In fact, I thought the only thing better than me catching one with Rob's equipment would be Tom catching his first during the trip. A side story to the catch was that when Rob caught his, my sister Jane went to town and bought him a shirt with "Muskie Man" and a man in a superman outfit on the front. Well, Rob's wife Jane brought the shirt up to Mercer with her with instructions that whoever catches the musky during future trips must sign the shirt and gets to keep it until the following year. Tom got the honors this year. I'm sure Rob was looking down from heaven and smiling. I'm booking for that shirt next year.